Notice that in a real product we should of course add the other browser prefixes and go prefix-less but as the functionality now only works in Firefox, this is enough for this demo. We test the browser for support by checking for contextmenu on the body element and for HTMLMenuItemElement in the window (this has been added as a pull request to Modernizr, too). Wouldn’t HTMLMenuItemElement be enough? Yes, but a real context menu should only offer functionality when it is sensible, and that is where contextMenu comes in. We then loop through all the menuitems with the class wordcount and apply the functionality. We need to find out what has been selected in the page. We do this by using getSelection() and splitting its string version at whitespace. We then show the counter by removing the hide class name. You can see this in action in the second context menu demo. Now, the issue with this (as explained in the screencast) is that it always counts the words, regardless of the user having selected some text. What we want is the menu only to be active when there is text selected. So in order to make our menu only become available when it makes sense we check if there is a selection in the document. Every context menu fires an event called contextmenu when it opens. So all we need to do is to subscribe to this event. Great news! How accessible is this? For instance, is there any way to indicate that the word count is a result of the action in the contextual menu? Can we only had new options or have we methods / attributes for disabling or hiding the browser menu options? I think that’d be rather inconvenient, and might actually be a security risk. The first silly use would probably be to disable to “View Source” menu item or the “View Image”/”Save Image” items for pseudo-protection… but I think it could go much further than that, exploit-wise. Yes, this is why for now you can “only add” new items and not override the original ones. Hey Chris, thanks for the write-up! This is cool. The first thing I thought of when reading this article was “hehe let’s try to replace a default action like Back with some custom action, could be fun”. 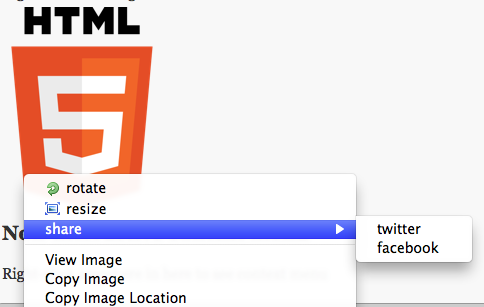 This would be awesome, if I’m writting a web app there’s no reason why “View Source”, “Save Image”, etc. should take up space in the context menu. They’re not useful if a web app, why should I be able to save the image of a button? People can always find these options elsewhere, like in a menu or download the source manually. My point is that when you force web apps to have all these left-over things that are only useful for when a website is a document, you’re making the web application platform less appealing. Trust the web developer, if they want to obscure images, which is as you put it “silly”, they can just do it using js, css or whatever. My point is that from a usability point of view, letting people remove default context menu items would make sense. And if some web devs, wishes to destroy the default usability by abusing this feature, that’s their loss. I’d be interested in finding out how this happened. Is it because Addy Osmani is a namel well known on the net and I am not? Or did the guy looking for a polyfill just link to the first hit on google? Is there a road map regarding your context menu stuff? Currently one cannot (optically) tell aparty controls, checkboxes and radio elements within a context menu. (Amongst other difficulties I have with the native implementation). Who would I bug with my questions? Actually it is because we were talking to each other when I was showing him the native implementation and he went for it. He was the first to tweet back and start the discussion on Google+. Nothing about being famous at all. Great to get your resources and feedback. I will try to find out who is the best person to talk to you about it. Is there a bug open on the issue with checkboxes? Just a nitpic as we discuss html5, usage of the Section element without a heading inside it. If not, it should be a div or something better. Otherwise a fascinating new realm of possibilities making your site feel like it is an app, or better. Awesome article. Just a small tweak — `’contextMenu’ in document.documentElement` would be better, for cases when body doesn’t exist yet. Also, what exactly is `”HTMLMenuItemElement” in window` supposed to determine? That menuitem element is supported? It just made me wonder if this kind of relation check is safe — is implementation really required to expose HTMLMenuItemElement interface publicly+globally when adding support for menu item element. Does IDL mention it anywhere? Just what I was looking for this script I’m working on! really cool! This is very interesting. I bumped into it while surfing trying to answer the following request: I’m looking for suggestions on how to give the user a visual clue that a context menu is available. I have a table, like a report, of “hits” in a database. Each is one line, with about 7 columns. 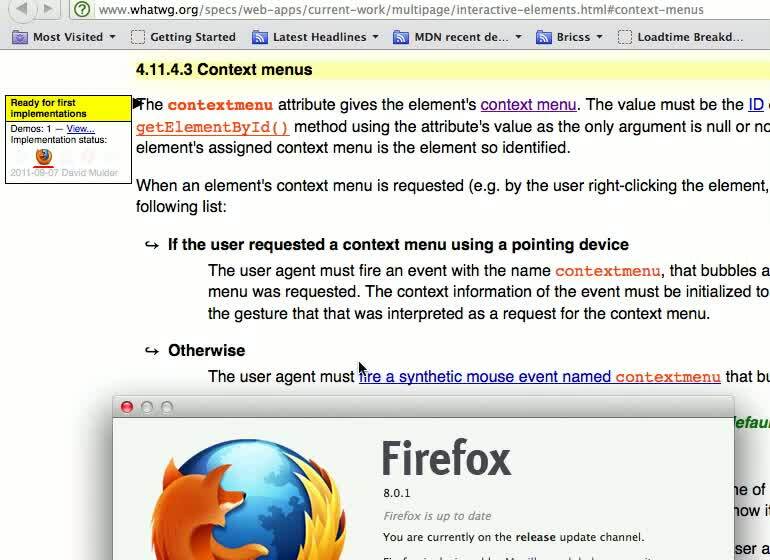 Each element has its own context menu. Currently there is no visual clue to users that all those features are available and based upon feedback, people don’t know that they are there.